In a city with a history as tumultuous as Berlin’s, you are bound to miss some of the storied sites and places. 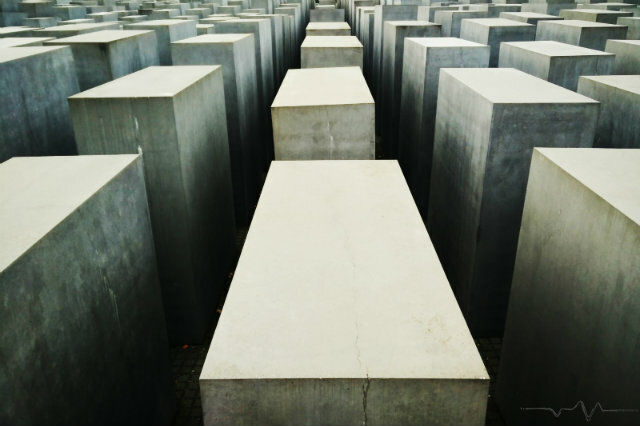 Such is the nature of the Holocaust Memorial, constructed in vicinity of the bunker where the perpetrator of all the heinous crimes against the Jews took his own life, just as he had taken millions before him. Situated only strides away from the famed Brandenburger Tor, this memorial is right in the middle of the tourist center of Berlin. Indeed, anyone could simply pass by this site thinking that it is merely an architect's insane expression just like I almost did, before realizing it was more than what meets the eyes. 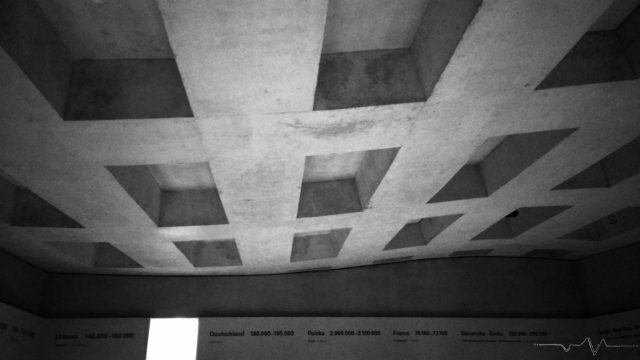 Covering an area of 4.7 acres, there are 2711 concrete protrusions (called stelae) of varying heights from 0.2m - 4.7m. It is a field of stelae, situated at an equal distance of 0.95m. My curiosity was piqued enough for me to venture into this labyrinth maze of evenly laid out stelae, but after the first few steps in my impression was that of a failed attempt to commemorate the six million victims of the Holocaust. While walking deeper I pondered the architect's attempt at 'transforming the primary perception of architecture - visual reality into a tactile experience’ and I failed to notice how the stelae had taken on lofty proportions, slashing my visual perspective into a narrow band of pavement that lead to a tree and the sky beyond. An eeriness had settled in, a constricting feeling of being engulfed by the slightly jagged-somber grey concrete forms and the undulating topography of the land. It took a moment of realization to push away the claustrophobic emotions the memorial had evoked. It was as if I had entered a field of order but walking further into the grid into the imposed uncertainty threw me off-guard and exposed my inherent fears of disorientation and the potential for chaos. The enormity and the scale of horror of the Holocaust is such that any attempt to represent it by traditional means is evidently inadequate. Our memorial seeks to present a new idea of memory as distinct from nostalgia. We can only know the past through the manifestation in the present. The memorial presents an opportunity to explore one’s own interpretations triggered as imminent responses of being confined in this environment. By altering the function of the stelae into a bearer of information, a formal link is forged between the Field of Stelae and the Information Centre, a transition from the abstract plane to that of concrete content. Past a line of images of the persecution and murder of European Jews, and a huge portrait of six people, we enter the Room of Dimensions, which explains the extent of the violence against Jews in each of the then twenty European countries. The Room of Families reveals the fate of fifteen different families from varying socioeconomic classes of the pre-Holocaust Jewish community. The Room of Names hosts a continuous audio of biographies of individuals (their name displayed on walls) which was collected in association with the Yad Vashem Memorial in Israel. The various atrocities carried out by the National Socialist regime are displayed by location in the Room of Sites. The design is reminiscent of everything that we have seen and observed aboveground and reminds us that we are still beneath the Memorial. 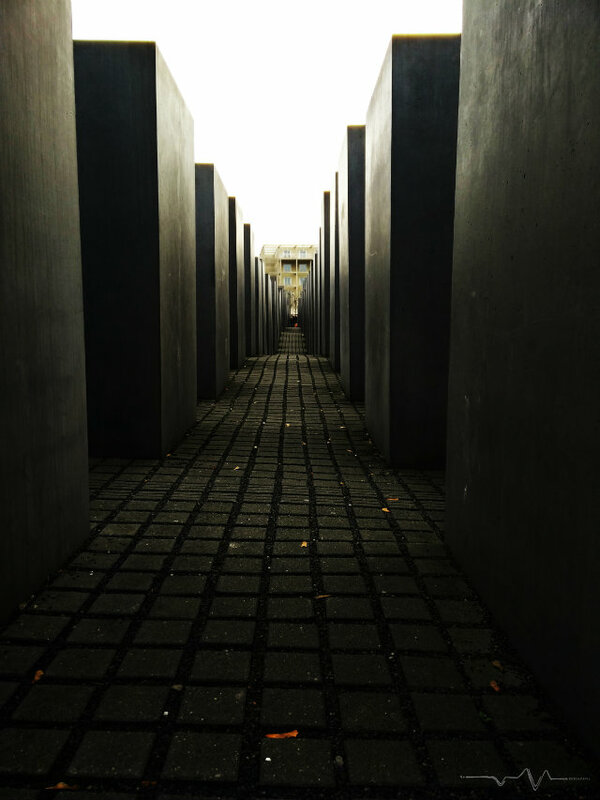 Returning the audio guide and climbing up the stairs, I saw the last rays of evening sun reflected from the stelae and could not help but wonder at both the brutal reality of what the Nazis had done to the Jews, and the memorial that now stands. A grave in their memory - a memorial of stelae, bearing a striking but unintentional semblance to the Jewish cemetery in Prague. The innumerable Jews murdered during Nazi Germany have a resting place here, where every human belongs to after death, in the earth. (Opening Hours) Dec 24 to 26, Dec. 31 from 16.